Oh my God. 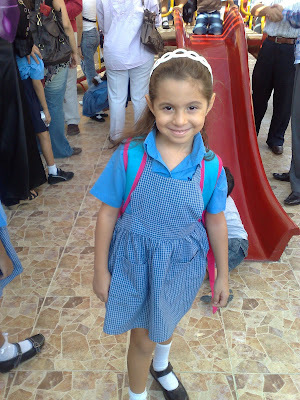 I took Safiyah to her first day of KG1 today and it was utter chaos. There was no semblance of order or organization at all. It was one huge mass of parents and kids in baby-class, KG1 and KG2, crammed together. The Headmistress spoke into a mic no one could hear calling off names of which kids were in which class and people tried to squeeze by to get through, I'm telling you it was insane. I kept looking around me for anyone else who thought this was crazy but it seemed like everyone was used to this. Why couldn't they just let each of us take the kids to their class and be done? The names were printed outside the classes so I don't see why we had to stand in the heat and make the kids stand there with their backpacks and... ugh it was truly a nightmare. I finally got Safiyah in her class and met her teacher, then double checked the bus driver knew she was going with him. Everyone brought the bag of items they asked for, Dettol, tissues, etc and when we asked they said..Monday. Why could the kids have to carry a bag to school Monday when we have it here now? I asked the Headmistress so she said I could write Safiyah's name on the bag and then leave it in her office. So I had to go to the office to get Safy's bus name tag thingy anyway so I went and was spoken to rudely by the woman there. I just stood by the door waiting to be ackknowledged and she was rude, telling me what to write on the tag. I was almost gonna cry so I just took my sad little self out of there and left. On the bright side I went to breakfast with E. It was really nice! awwwww poor you! well humdullah THAT is over! I remember once someone was really rude to me in the pharamacy and it felt so good to just say, "OK, but you dont need to speak to me in THAT way." Of course she was probably as frustrated as everyone in that chaos but we could all be a little more polite! Your first day at school sounds like my day on the road of the first day here in Cairo. People went nuts! UmmTravis, thanks I wish I said something. Skye, thank you. I need to be more assertive. Rude people deserve to be laughed at. She was just taking herself a bit too seriously, I think! Okay, my first day of kindergarten I wore a home-sewn blue dress,a pink ribbon in my hair, white tights, and black mary jane shoes almost identical to Safiyah's! It's like she is wearing the 2009 interpretation of my 1988 look. The more things change, the more they stay the same! Ahhh, I hope you would never cry in fron of someone who was rude, it gives them satisfaction. I think hindsight you could have said something, but I respect the fact that you walked away and left her to her misery. My hubby would just freak out every time someone was rude to me in Egypt...it wasn't worth it for me, but if I did I would have screamed or said something distasteful maybe. Awww...you poor thing! I hate rude people! More often than not, I walk away too...mostly because I'm too in shock to come up with something quick and witty and biting to say. Just "Keep your head up!" PS - She is so beautiful! Hoping the school chaos dies down as time goes by. Designerd, hee! That's the uniform:) Everything old is new again. Thanks. Salma, Thank you. Yea I'd hate to cry, sometimes when I'm angry I could cry but I hate that. Yea it's weird they are sooooo nice to my husband. That's terrible! I think I would have had a hard time being more assertive in that situation too. I hope Safiyah has a great school year! the mrs. haha, I kinda worry also they could take it out on the kids if I made a fuss or anything. Who knows. Thanks! Rude people drive me nuts too!! .I found it difficult to say to a rude person that he/she is rude in his face too..it needs guts ,I know!! Anyways..Hope this hectic day didn't spoil Safeyah's very special day..this very first day of school happens once in a lifetime and it had to be somehow special so not to make the little girl detest everything about school in the future! !Hope her class teacher is a sweet one .BELIEVE ME ,to a newbie,this is what matters the most!! Dearest Mona, I am so sorry! Honestly, I can't stand rude people! There had been several times I almost broke down in tears, but I tell myself ... "I will not give you the satisfaction of bringing me down!". As for people, they always make me wonder. Anyway May Allah protect Safiyah and of you. Amen!